Bentley has given a glimpse of its possible future direction with the unveiling of the new EXP 12 Speed 6e electric concept car. 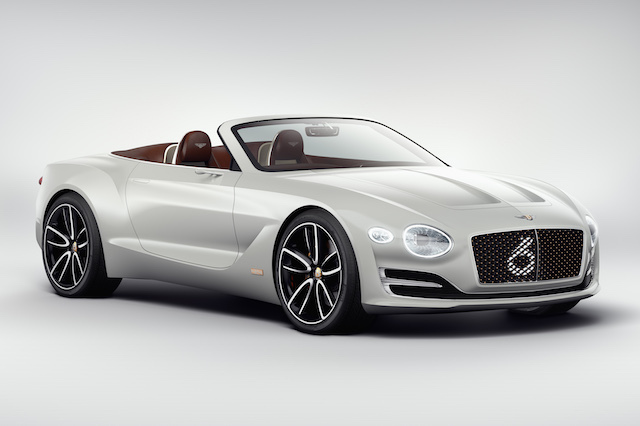 The luxurious convertible – which was revealed today at the Geneva Motor Show – will help the British manufacturer gauge consumer interest in what could be its contender in the high-end EV market, which is currently dominated by the Tesla Model S.
Bentley first suggested that it was interested in pursuing alternatively fuelled vehicles with the introduction of the EXP 10 Speed 6 at the 2015 Geneva Motor Show. The earlier concept was a hybrid, but a fully-electric variant was discussed at the time. The EXP 12 continues the design theme that was introduced by the earlier EXP 10, and showcases how Bentley's design language could adapt for cars that don't have huge engines under the bonnet. Thanks to electric motors on the car's axles and battery packs down low in the floor pan, Bentley was able to give the EXP 12 its distinctive low front end. No word has been given on the new concept's powertrain, but it wouldn't be unreasonable to expect Bentley to make the most of its VW Group relationship with Porsche. The German sports car manufacturer is currently developing its Mission E EV project, which uses an 800-volt battery and boasts a 310-mile range. Wolfgang Dürheimer, chairman and chief executive of Bentley Motors, said: "The EXP 12 Speed 6e is a concept to show that Bentley is defining electric motoring in the luxury sector, with the appropriate technology, high-quality materials and refinement levels you'd expect from a true Bentley. "This concept enables us to engage with luxury customers and gather feedback on our approach." It's still early days for Bentley with regards to its EV strategy. The first low-emission production car that will be seen from the British marque will be the plug-in hybrid version of the Bentayga SUV, which is due to arrive in 2018.